The deer have had enough of winter too. A trip down route 9 through Amherst in the evening is a good opportunity to see a number of deer. 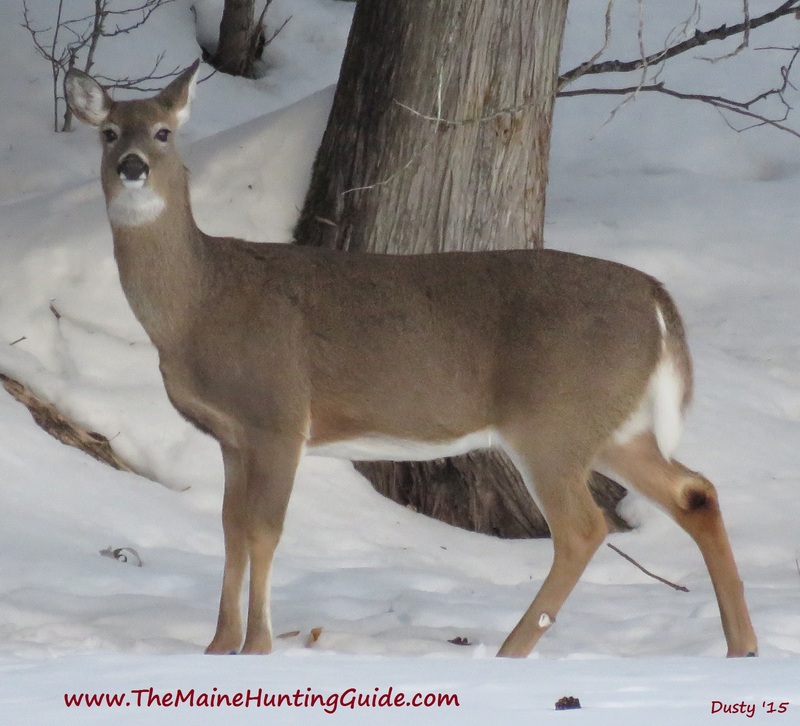 I've been seeing more deer along the Stud Mill Rd this year. That's a good sign. 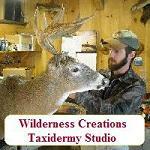 Here is one gorgeous buck, they are beautiful in velvet. This is a rare oppoertunity... Moose and Bear checking each other out. Downeast Maine. Parked the truck to watch in one direction and this guy came out behind me. Happened to see him in the rearview mirror. 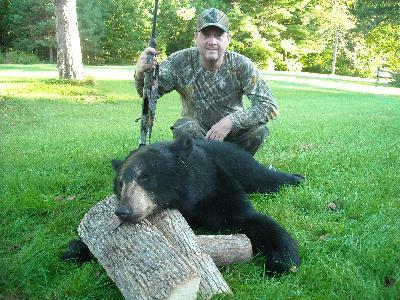 This black bear came from the same place as the bear the week before. He didn't come as close this time, just foraging in the grass. Back to my favorite spot along the Stud Mill Road. This guy was already on the powerline about 100 yards out ended up less than 20 yards before disappearing down a bank. June 8, 2013 Shot a "Grand Slam"
The Stud Mill Road provides great opportunity for seeing game. 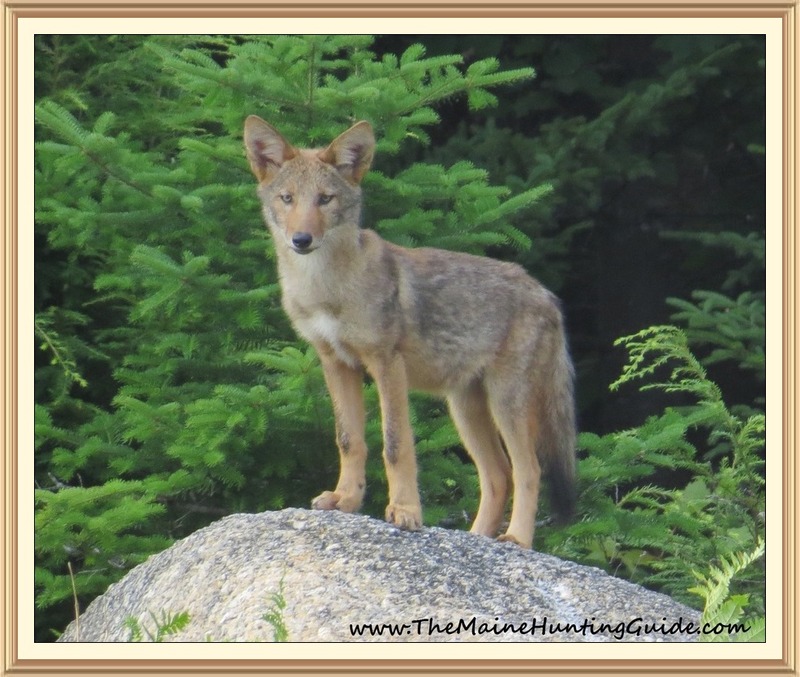 On saturday I saw four deer, two moose, two bear a number of turkeys and geese with goslings. Was down off the Stud Mill Rd again and saw this guy. I watched him forage for about a half hour untill he finally got down wind of me. It's a good size bear, been doing some rubbing. The other side is just the same. Rubbing is in preperation for the breeding season in July. He's putting his scent on trees to attract females. I think he means business. He also walks with a gimp. He has a problem with his front left paw, maybe from a trap or a fight. I couldn't see it very well. I saw another bear, but he had seen me too, I was in the truck at the time. Saw two moose, numerous rabbits, partridge and chicks, turkeys and chicks. So a pretty good few hours. Sounds like a sports score, but it was a phenomenal day of sighting wildlife! The Stud Mill Road "Corridor" offers a unique opportunity for outdoor enthusiasts of all pursuits. This little guy and his two siblings headed up a tree when I drove by. Momma was back in the woods about 50 yards and didn't seem to have a problem with me getting some pics, but I tried to not over stay my welcome. I saw four two year olds together first. They didn't stick around long, although one went up a tree for a couple minutes, then thought better of it and came down. To quick for pics! I saw one foraging along the road side, but he saw me before I could get the camera focused. The other two I saw from my perch on the powerline. One was a hundred yards in one direction the other was 300 yards in the other. I also saw two of the moose from the powerline. When I went back to my truck to leave in the evening there were two other moose watching me from about forty yards. Ed Crosby of Katahdin Mountain Lodge and Guide Service helped two young partridge hunters bag their first birds. Fourteen year old Kirsten and Thirteen year old Stephen look very pleased with their success. 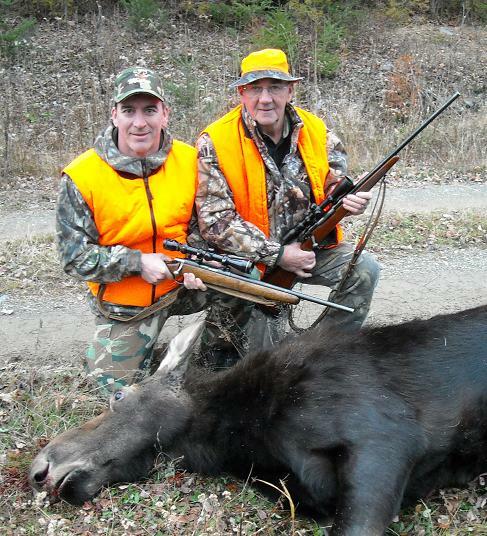 Successful start to the 2011 Moose Season! 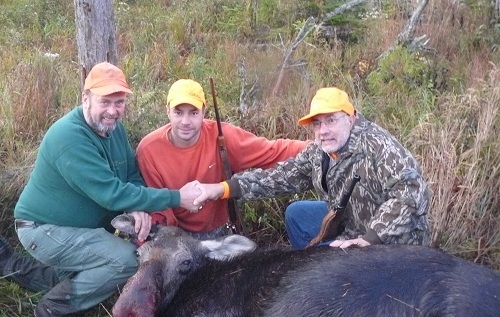 Ed Crosby of Katahdin Mountain Lodge and Guide Service with John and his son John of New York with their first Maine Moose. A 538 lb cow, taken mid-week of the September hunt. 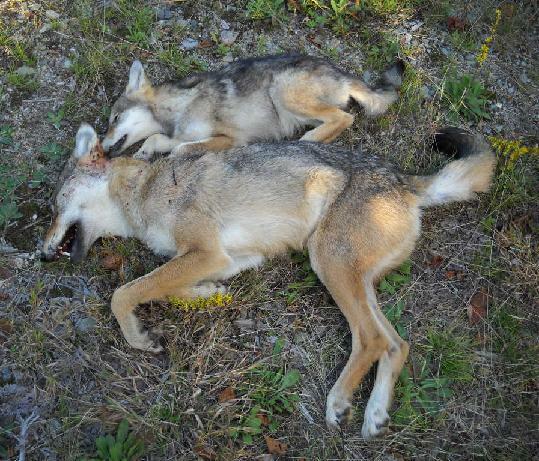 Hunting in the Grand Lake Stream area wasn't productive for bear but here are two of the three coyotes I shot while camping in the area. I'm getting the pup mounted. 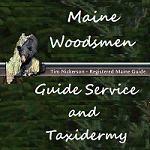 Ed Crosby of Katahdin Mountain Lodge & Guide Service makes the rounds baiting, a daily ritual. I put this video together myself and I'm not a professional videographer, but we had a good time. The second day of bear hunting, no luck yet. 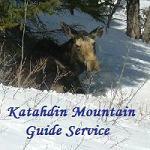 Stephen and I are hunting with Ed Crosby of Katahdin Mountain Lodge and Guide Service. The hurricane messed up the bears routine. He had them coming to the baits before the storm, but they're slow coming back to them. Went Down East Sunday hoping to see a bear. I saw two. This guy crossed the road about 30 yards ahead of me as I was walking in to the powerline. I followed him for about 45 minutes as he foraged along. Went out coyote hunting, and had this black bear visit. I've been filming bears in this area for three years, he may be one of the cubs from three years ago. Bagged my first coyote. I was deer hunting and using a doe bleat, when this critter came along. 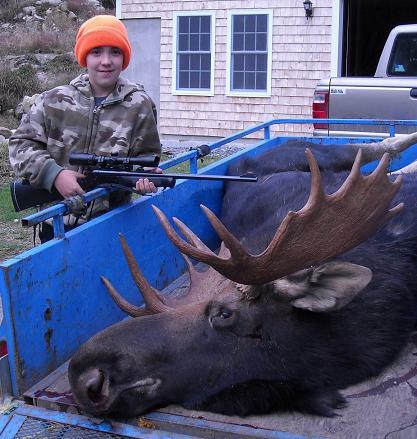 A successful moose hunt, Todd Perry (cousin), with father David, shot this 441 lb cow the first day of the November hunt. A well placed shot dropped her right on the spot. Luckily the spot was barely out of the road, so there was no problem having her in a good place for easy loading. We called in this nice 5 pointer openning day. The rack is deformed on the left side. It has one tine growing across the skull with two short points going up. The most rewarding hunt I've ever been on. We worked our way guietly down wind of a bedding area stopping to call as we went. We had got in about 100 yards and were sitting on a blowdown. 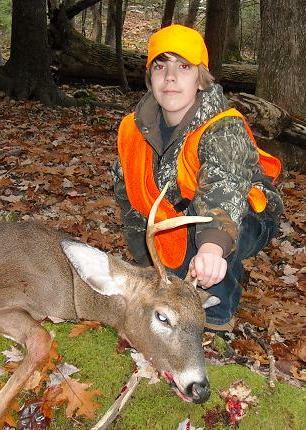 I was using a True Talker I think Hunter Specialties makes them, doing a doe bleat. About 40 yards right in front of us I see this guy. Stephen hadn't picked him out yet. He was broadside behind some trees and looking right at us, my heart was racing. I gave another bleat and he stepped out from the trees, still broadside. At this point Stephen saw him and had a clear shot. 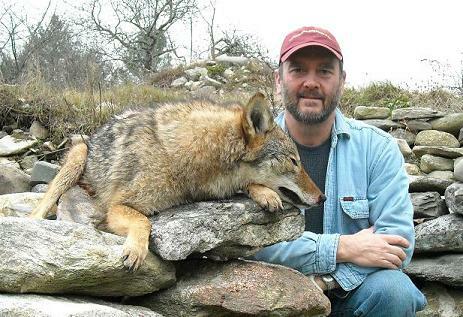 He took his time, made a well placed shot with his 243 Rossi. I see the deer react to the bullet and was confident it would be fatel. We gave him about 10 minutes then checked for blood. I couldn't find any blood or hair but was sure it was a good shot. Checking in the direction he went we found him not 40 yards away. Certainly a special experience. 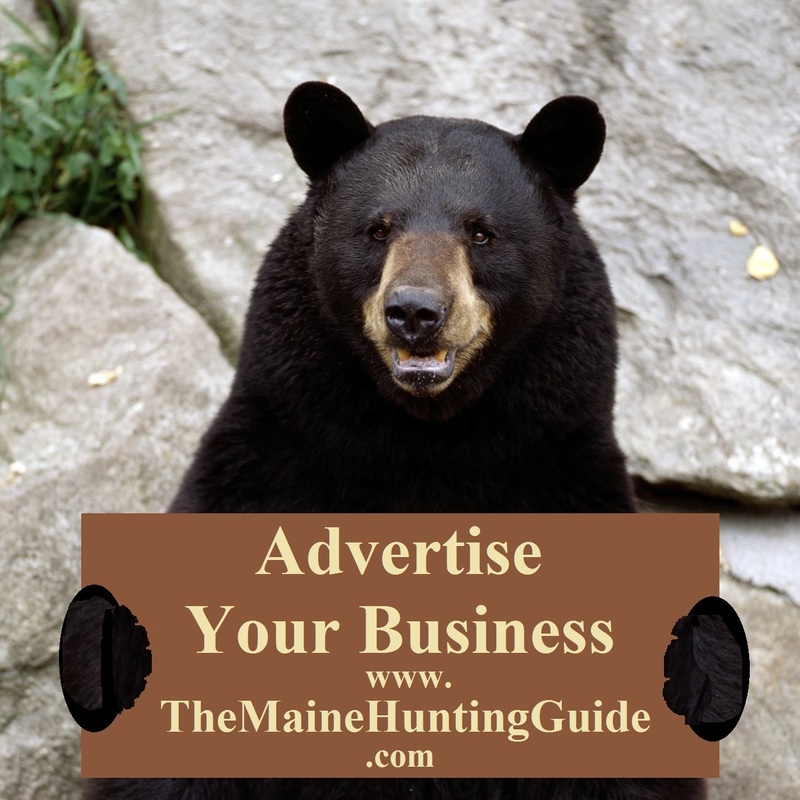 My second Maine Black Bear, this one taken in WMD 19. While scouting for Stephen's moose hunt, I was seeing lots of bear sign. So I started hanging around in the evenings (preseason) to see what I could see. Two Videos of the bears on Aug 22,09. This bear was the 10th bear I had seen, most were preseason. 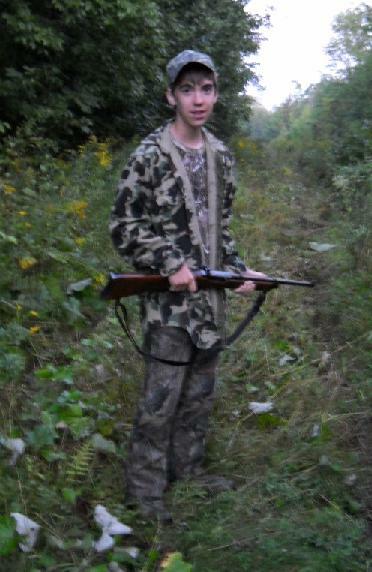 One happy hunter, not bad for his first kill at age eleven. 740lb Bull with a 43in spread taken in WMD 19.Trophy of a lifetime. I did a lot of preseason scouting but didn't find a really good area for calling. So we ended up driving lots of miles searching and it finally paid off on thursday of that week.